Preheat the oven's broiler and set the oven rack at about 6 inches from the heat source; prepare the rack of a broiler pan with cooking spray. Season the salmon with salt and pepper and arrange onto the prepared broiler pan. 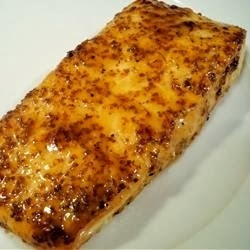 Whisk together the brown sugar and Dijon mustard in a small bowl; spoon mixture evenly onto top of salmon fillets. Cook under the preheated broiler until the fish flakes easily with a fork, 10 to 15 minutes.